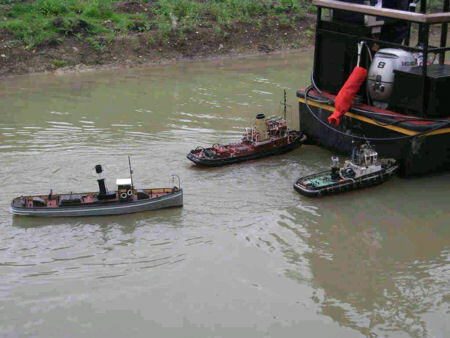 Three of the clubs tugs doing what they do best! 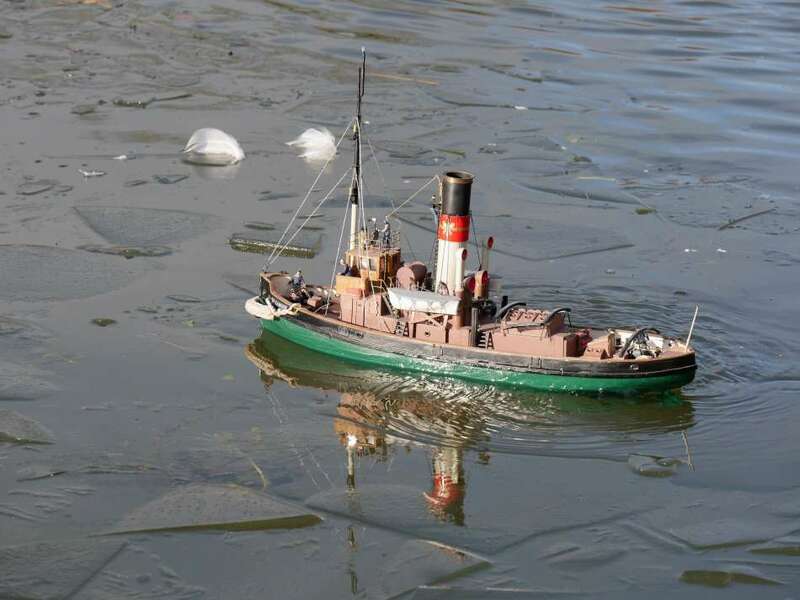 In the picture above is Mark’s Twin Screw Imara Tug towing “Mister Maysey” back to its dock after the engine broke down on her inaugural outing with new engine. 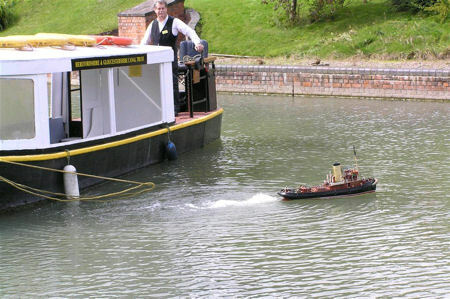 Oh the shame of being towed back to port by a model, Ted was last seen negotiating salvage rights for G&DMBC! It is powered by 2 x Mobile Marine T12 electric motors, 2 x 75mm 4 Blade Prop Shop propellers and 2 x 15A Mtroniks Speed controls. and a single 12V 22Ah Battery. Mixing of the rudder and throttle is done at the transmitter end by using “elevon” mixing in his Spektrum DX7™. 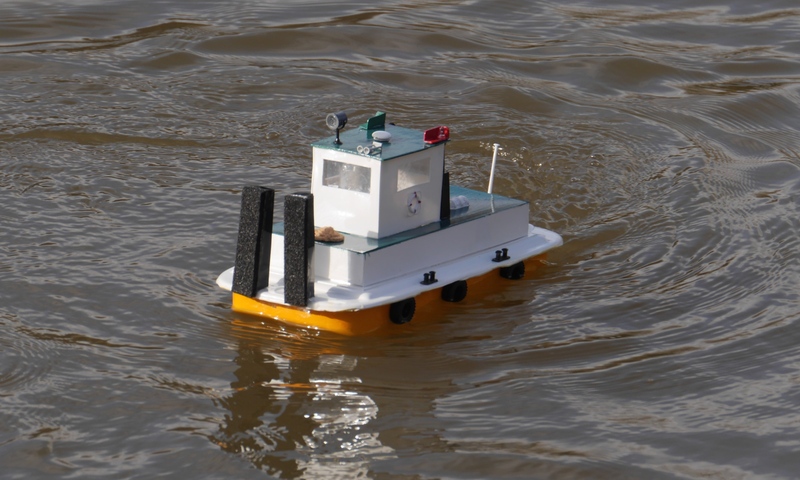 Pictured above is Mark D’s Mobile Marine Models Canning Tug. It is powered with a MMM T12 electric motor & a 4blade 75mm Prop-Shop Prop, this combination gives this model a good turn of speed and plenty of bollard pull. To get her down to the correct water line Mark believes in “useful lead” so a single 12V 22Ah battery is used for this purpose! 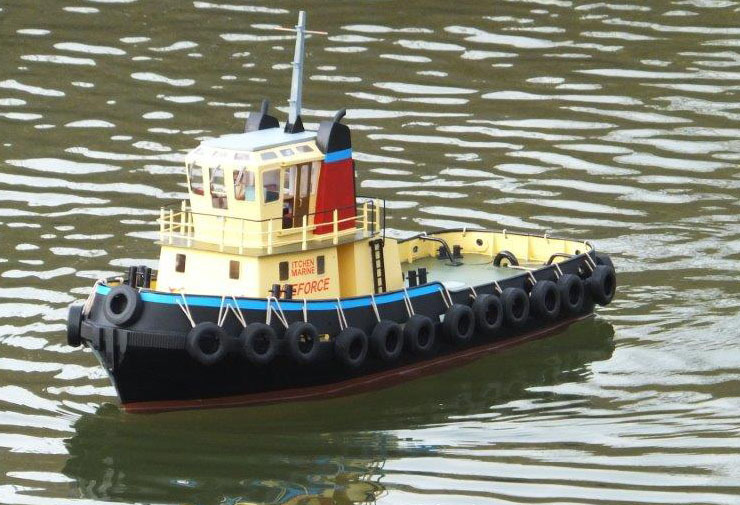 Here we have Pete’s recently acquired Bugsier tug. She sails really nice and is equipped with LED lights so is ready to take on a tow day or night. 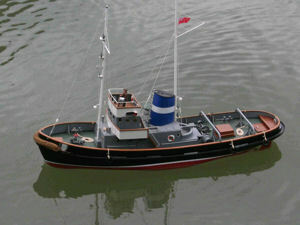 Mark’s Marie Felling Tug from a Calder Craft kit. Its a real weight lifting challenge getting it in and out of the water with its 12V 17Ah battery (no its not a typo!) and a 12V 7Ah for the smoker, plenty of power to run all day though. The drive motor is an old Smiths Industries fan motor. It is also equipped with a MMB smoker for steam effect out of the smoke stack. Armando’s Wee Morag: Built from the £10 ‘kit-in-a-bag’ vacform from George Turner Models; less than 1 foot in length (approximately 1/32 scale); she uses a mini servo, Cirrus micro r/x and is powered by a cheap 380-size low-revving motor (5 cells, a custom 6V pack) turning a 29mm 3-blade prop; an Mtroniks 10A micro ESC controls the motor; markings are home-made waterslide decals; figures are from the GTM (resin) range; oil drums and crate are scratch built; the remaining deck clutter is from a Tamiya accessories kit. 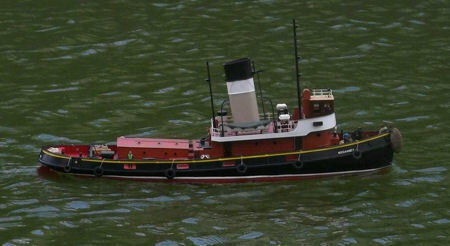 Above is Marks twin screw Imara Tug. It is powered by 2 x Mobile Marine T12 electric motors,2 x 75mm 4 Blade Prop Shop propellers and 2 x 15A Mtroniks Speed controls. Mark likes his ballast work for him and not just along for the ride so to power the beast for over 6 Hours of constant sailing it has a 12 Volt, 22Ah golf battery in it. Steering is done mostly by prop as the rudder is out of the prop wash, mixing of the rudder and throttle is done at the transmitter end by using “elevon” mixing in his Spektrum DX7™. this works very well and can turn the tug 360° on the spot. The second picture shows his daughter (Lisa) testing the pulling power and she confirmed the tug was pulling very well, later that day “Imara” was seen towing a dingy with a young girl in tow around the lake. Bob’s RMAS Forceful – used in the 1950’s for towing Britain’s fleet of aircraft carriers. 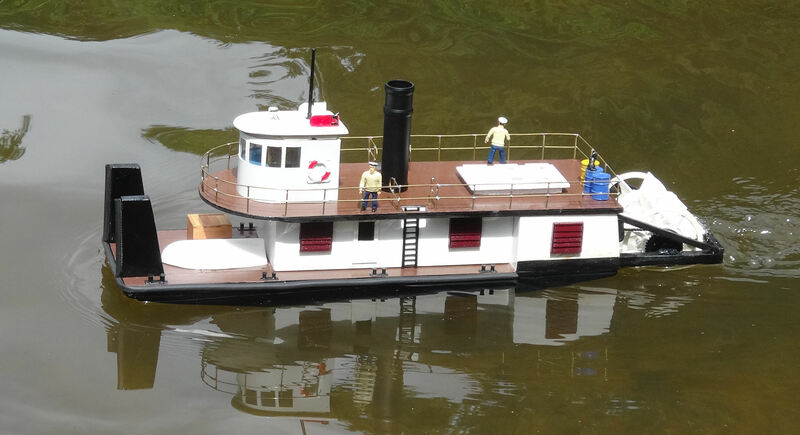 The model is from Argus Plans and a vac-formed hull with plywood superstructure and planked decking, It is driven by two “Pile” motors and gearboxes via tooth-belt drives. As you can see it gives a fair wash when it is under way. 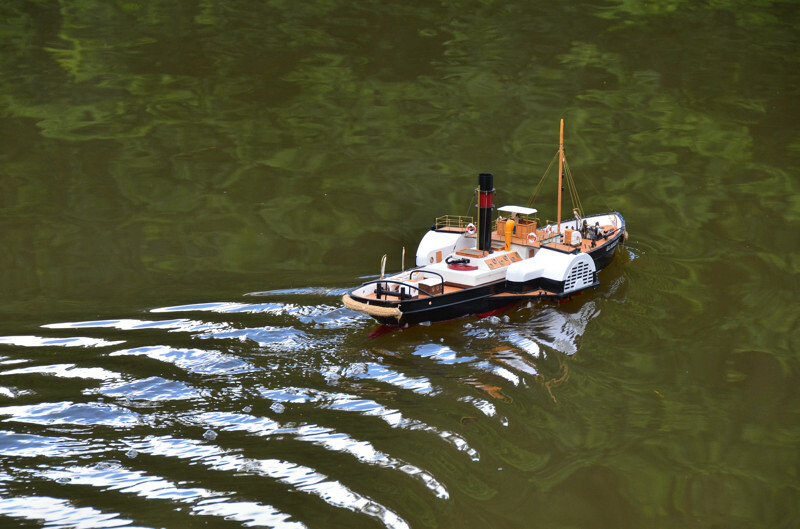 Above is Derek’s scale model of the “Mayflower” Originally built for Steam power but has been converted to electric. 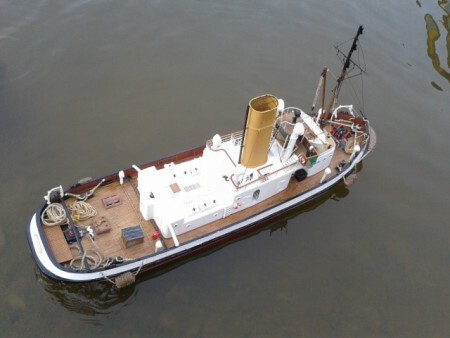 Mike ‘s Model Slipway Tug Wyeforce almost finished very powerful model and very manoeuvrable, Mike is a toolroom engineer and all the fittings are immaculate and in full working order, the berthing tyres are all correctly hung, it can turn in its own length and will push a full sized boat. 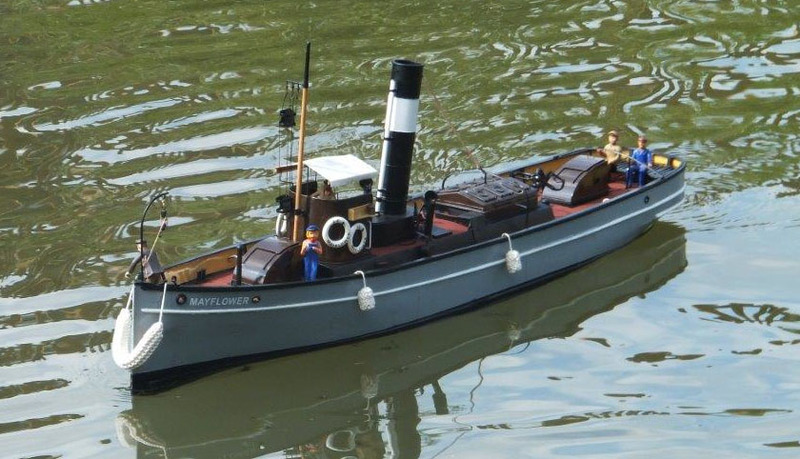 It started life as a steam tug, became a diesel powered one and has now been restored as original, the models in the club show it in its several versions, Phil made the hulls for all the models. 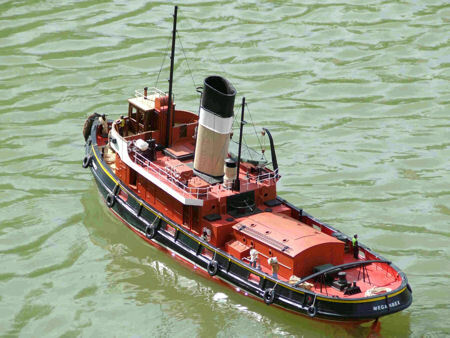 David E’s the first ever steam tug 1801 – 1804 “Charlotte Dundas” had her maiden voyage at the Warwick Show, now detailed and finished. 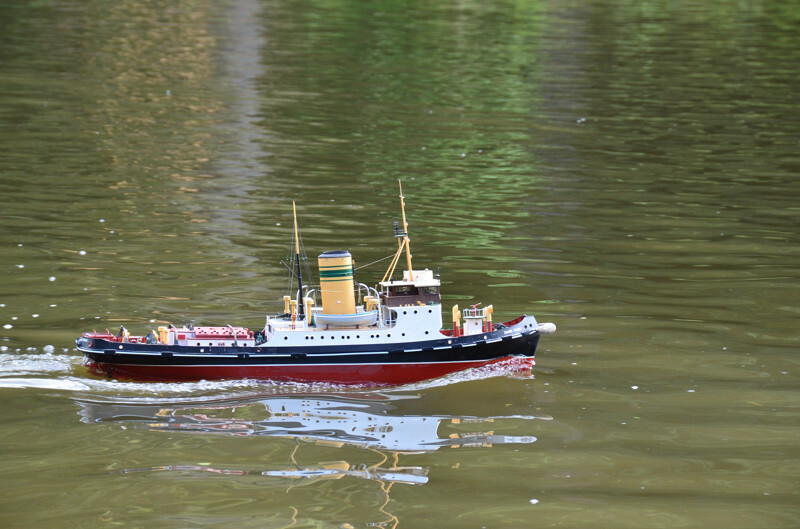 Copyright © 2010 [Gloucester & District Model Boat Club].